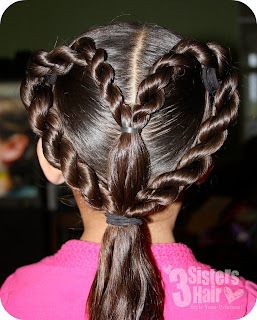 This is an adorable Hair "do" for Valentines this year! Twist or Braid 1 section. Secure with band and set aside. Now go to the other pony and do the same as you did in steps 2 and 3. (now you have two braids. Pull them together and secure with rubber band. It will lay in the center of your child's head where the part is. Now pull all three sections together forming the bottom of your heart. Secure with finishing band. Bobby pin the top of your heart in place. (otherwise the heart will look too straight) Basically give it a nice rounded shape. if you child has really long hair like mine, you can finish the pony tail on the bottom in many different ways. twists - do the same and twist 3 separate strands. mix and match - twist and braid the bottom as well as leaving some hair hanging straight. This gives the pony a cute look. If you have any questions about this hairdo or want more instructions please email me. I would love to help! And share your hair creations photos at our Flickr Group too! if you'd like to take a look. This is cute. Wonder if it would look good on Colin??? If you can not tell... I need a little girl! Thanks girls. As you can see, Cass has a lot of thick hair. So doing her hair is soooo fun! Have fun with it Lanie. Anne, there is always next year. Start trying!!! LOL Would love another little girl in the group. Hee! Hee! Absolutely adorable. What little, or big, girl wouldn't want to do this for Valentine's Day? WOW!! I've never seen that done. Not sure if I could do that. this is amazing. I can't wait until my little ones hair gets longer. Thanks for playing along.. Have a great Valentine's Day.. Thanks for linking up. Oh how cute. Can't wait to do this on my daugther one year. Happy Valentine's Day!